Mmm..Cinnamon rolls!! 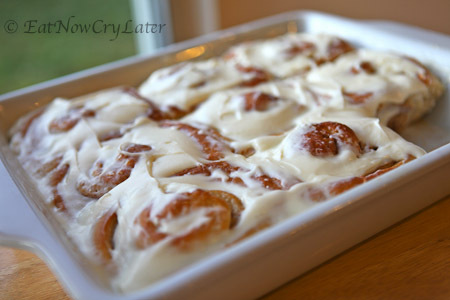 Not just any cinnamon roll...these are super soft, HUGE, and taste HEAVENLY!! They may not be forgiving for my figure, but what the hell, I was having a terrible day and the fat girl inside of me was DYING to come out and play! Try this recipe out and you won't be disappointed!! *This frosting makes enough for two batches so cut recipe in half or keep the rest in an airtight container and keep in fridge for later use). *You can purchase the diastatic malt powder and baker's special dry milk from King Arthur's website! I wouldn't skip out on these two items because I KNOW, it's what sets my recipe apart from others. The result is a softer and fluffier cinnamon roll. Bakers dry milk powder is NOT the same as the dry milk powder found in your local grocery store! A lot of people use milk in their recipe but I find that dry milk powder works best, especially when using with yeast. If you MUST use milk, use skim milk instead of whole milk. Take your warm water and add in your sugar. Sprinkle in your yeast and allow to proof for about 5-7 minutes or so. You know your yeast is activated when your mixture looks foamy/creamy. While your yeast is proofing, take your all purpose flour, potato flour, vital wheat gluten, salt, diastatic malt powder, and bakers dry milk powder, and combine them in a large mixing bowl. Take your egg and slightly beat it with a fork and set aside. Once your yeast is activated, give it a small stir to loosen up the sugar that has sunk to the bottom. Pour it into your flour mixture along with your beaten egg. Mix it with a wooden spoon until fully incorporated. Pour your dough into a food processor and pulse for about 1 minute and 20 seconds. Take a small handful of flour and spread it on a clean work surface. Dump out your dough onto the counter and work quickly with your hands to make a small, more manageable ball. It doesn't need to be completely smooth for this part. It'll be slightly tacky and wet, but try to refrain from adding any additional flour. Place your dough into a slightly oiled bowl. Toss the dough to coat to prevent a crust on the tops. Cover the bowl with saran wrap and allow to double in size, about an hour. While your dough is rising, make your filling. Mix your cinnamon, brown sugar, and white sugar in a small bowl and set aside. After an hour or so, remove your dough from the bowl, and place it on a lightly floured surface. Take your lightly floured rolling pin and shape your dough into a large rectangular shape, trying to make it as even as possible. Take some melted butter and spread it over the dough but not all the way to the edges. Take your brown sugar and cinnamon mixture and spread it on the melted butter, leaving at least 1/4 inch space along the borders. Roll up your dough into a tight log and pinch to seal the seams. Do the same to the ends. Take a pastry cutter or serrated knife and lightly coat it with some baking spray. Cut your log in half at first and then proceed with cutting the rest into even slices. If you want really big cinnamon rolls, cut 6 to 8 slices instead of 10-12. The bigger the slices, the faster the second rise as well! Take some softened butter and spread it in your baking dish. Place your rolls cut side down in your baking dish, spray some cooking spray(like pam) on a piece of saran wrap, cover your pan, and then wait till tripled in size. Don't forget to allow some room for your rolls to grow(at least 1/4 inch to 1/2 inch in between each roll). Let them rise in a warm, draft free place until tripled in size! Two hours is a good time for me but may differ for you! Once your rolls are ready, bake them in a preheated 325 degree oven for 25 minutes. While your rolls are baking, take your softened cream cheese, softened butter, powdered sugar, and vanilla extract and beat until nice and creamy. Taste check and add more powdered sugar if you wish. Set aside. Once your cinnamon rolls are done baking Take some melted butter and lightly coat each roll. This will add to the overall softness of it. Immediately, take your cream cheese frosting and slather them all over the rolls while they are still hot. Serve warm and ENJOY!! what if i do not have active dry yeast but saf yeast instead...would i just deduct 25% from the recipe? i so look forward to trying this and btw, i love the you tube video! I've always used active dry yeast but from what I understand is you deduct 20% of the yeast called for in the recipe. You would still use the same amount of water but instead of adding the saf yeast into the water...you add it straight in with your dry ingredients(just remember to add in your liquid later). Hope this helps! Hi Jenny! You don't have to use diastatic malt powder. It does make the dough softer and lighter though, but it's not required. You can sub the bakers special dry milk with regular dry milk powder and you can find those in most grocery stores in the baking aisle. You may also just sub the potato flour with more all purpose flour instead. Hope that helps! for asking the same questions I had...really want to try this, but willtry another recipe first until I can gather your ingredients.. Please explain the overnight process again. I'm confused as to when to put in fridge..is there aproof afterwrds, etc? Hi Zane! You want to put the rolls in the fridge, on the second rise. The next morning, remove them and let them come to room temp before you bake them. In terms of the vital wheat gluten...not sure if there is a good substitute, considering it's gluten. I've read before of people using 1/4 tsp of powdered ginger or crushing 1/2 of a vitamin C(ascorbic acid) tablet into the dry mixture. I have not tried this method, so no guarantees on my part! :) Good luck! Can you substitute any other type of oil in place of the vegetable oil? Would olive oil be OK? I cannot wait to make these! No substitutions please! Def no olive oil. If I were to experiment then maybe try canola oil? These look so fluffy and tender! How long would you knead with dough hook if using a stand mixer? Thank you! To be honest, I've never used a stand mixer for this. Maybe for 5 minutes, or until it starts to form a ball. Add a little bit more flour as needed. The more flour you add to this recipe, the more dense your dough may be, so be cautious. Since you make it sound so easy, I will give these yummy treats a try. I'm going to be on a game show! !